Walkin tubs are an excellent addition to a disabled bathroom design because they allow users to enjoy the benefits of a real bath while being fully protected by advanced safety features. danger in using a traditional tub. themselves in and out of a tub. "climbing-in" because they are built with a low threshold for easy access. They are designed with water-tight doors that open to allow users to walk right into the tub before filling it up with warm soothing water. Most units contain a seating area and easy-to-reach faucet controls that make adjusting the water temperature easier than in conventional tubs. Some walk in bath tubs contain hand-held shower heads for easy rinsing, while others come equipped with water jets similar to those found in a Jacuzzi. 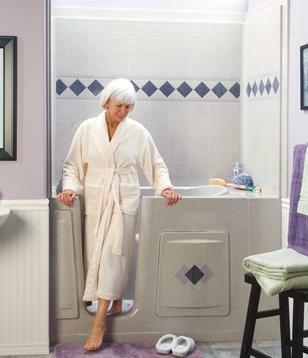 Seniors, those with disabilities and anyone else who doesn't want to have to climb in and out of a conventional bath tub can benefit from these units that offer superior features. Many manufacturers offer varying colors to match existing bathroom decor, dimensions that fit directly into your current tub space, safety grab bars, a waterproof door system, quick drain method, chrome or stainless steel fixtures, and much more that adheres to ADA bathroom requirements for safety. Reputable safety tubs also come with warranties and guarantees that assure you of a water tight seal and long years of trouble-free use. The next decision is whether to purchase a tub with an inward-swinging door or one with an outward-swinging door. Inward-swinging doors allow the person using the tub to walk right into the unit. Inward-swinging doors are usually less expensive than outward-swinging door models. Inward-swinging doors do provide a tighter seal with less chance of water-leakage, however, if there is an emergency and the unit must be drained before the door can be opened. Outward-swinging doors are generally a little more expensive. The main advantage of this type of model is that the door can be opened in case of emergency. If you are contemplating purchasing this type of walk-in tub, you must carefully measure the bathroom space in which it is to be installed. There has to be room for the door to swing open. Another advantage of an outward-swinging door is that the person entering the tub can walk right in without having to maneuver around the door once he or she is in the tub. Installing a handicap accessible tub can be complicated, so unless you are experienced with plumbing, it is recommended that you hire a licensed professional to perform the installation. Professional installation generally takes between one to three days, and usually includes removing the old bathtub, changing out the existing plumbing and adapting it for the new handicapped tub, installing the unit, and finally, cleaning up the area. In some cases, you must have the company that you purchase the tub from perform the installation in order to get the benefits of their guarantees and warranties. If you attempt to do-it-yourself or hire your own plumber, you may void the warranty of the tub. Please check prior to installation to familiarize yourself with the details. It's also a good idea to compare prices, warranties, and features among several walk in tubs before making a final decision about which product to purchase that is best for your particular situation.